Thank you so much, President Jimmy Morales. Congratulations to you, your team, Foreign Minister Sandra Jovel for such a wonderfully organized Ibero-American Summit. Dear Heads of State, Heads of Government, King Felipe VI, dear Foreign Ministers. 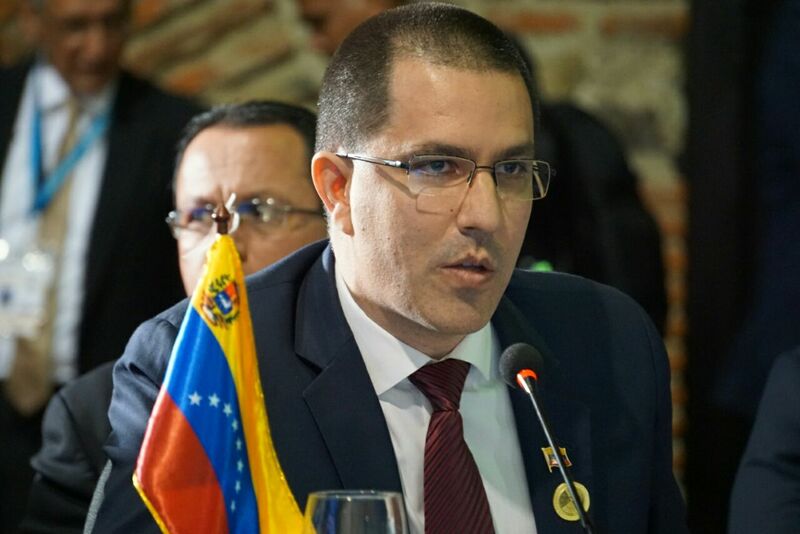 First, we convey greetings in the name of President Nicolas Maduro, who is focused on the internal work on the Venezuelan economy, but paying special attention to the summit. He sends his greeting to President Jimmy Morales. Secondly, we would like to talk about Simon Bolivar. Within three months, it will mark 200 years of his speech before the Congress of Angostura, which was the most strategic, complete and comprehensive oral piece and political literature which remain into force almost 200 years later. That was a constituent congress. We are talking about the 1819 congress, one of the many constituent congresses of our history. A first congress had been held before in 1811. Now, a constituent period is ongoing in Venezuela, as in 1999. The Liberator said in his speech before the Congress of Angostura, that “the most perfect government’ system is one that can give people the largest amount of possible happiness, the largest amount of social security and the largest amount of political stability “. We could compare, despite distances and times, the region of those times to the region that we seek in this prosperous inclusive and sustainable Summit. We will hold events in every Venezuelan Diplomatic Mission and in our country in the framework of the mentioned anniversary. We would like to invite the governments to participate. Bolívar in his speech of Angostura referred to the origin of our Latin American identity and I would like to read it briefly. The Liberator said: “We still preserve the vestiges of what it was. We are not Europeans; we are not Indians, but an intermediate species between aborigines and Spaniards. Americans by birth and Europeans by right, we find ourselves in the conflict of disputing to the natives the titles of possession and of maintaining ourselves in the country where we were born against the opposition of the invaders”. After, the Liberator refers to Africa to complete the formula: “We must bear in mind that our population is not the people of Europe, not of North America, that it is rather a composite of Africa and America, which is an offspring of Europe. Even Spain itself is not totally European due to its African blood, its institutions and its character. It is impossible to accurately determine what human family we belong to. The greater portion of the natives has been annihilated, the European has mixed with the Native American and the African, and this has mixed again with the Indian and the European. Our parents, all having been born from the same mother, all of different origin and blood, are foreigners, and all differing visibly in color of skin. These differences are very important for we are in constant re-union with ourselves. In the Angostura speech, the Liberator also referred to the idea of ​​the Great Colombia, which would encompass Venezuela, New Granada and Ecuador in one great nation. Later, this concept evolved in light of the Amphictyonic Congress of Panama convened by the Liberator in 1824. However, the first session was held in 1826 under the boycott and sabotage by the imperialist forces of the north, that continued over and over during several sessions and for decades. The Ibero-American Summit has its origin in the Amphictyonic Congress of Panama, according to Panamericans and the Interamericans. We believe it is our turn to meet again, re-unite again. In this light, since 1991, Ibero-American summits have become a space for cooperation, for the possibility of finding a respectful and healthy political dialogue to advance on the ground. We congratulate Rebeca Grynspan and her team. We consider that in recent years she has raised her work to a more integral, complete and higher level, much more concerned about the people and the concrete results. Yesterday, comrade Minister of Foreign Affairs of Spain said that, beyond political polarization in Latin America, these summits have encouraged a respectful political dialogue. Today is also the International Day of Tolerance. That is why we regret any dissenting or dissonant note, as President Alvarado of Costa Rica’s position this morning. Repeatedly, Venezuela and Nicaragua are used as “smokescreens” trying to hide the internal problems that all of us have. I do not want, and we do not want to meddle in Costa Rica’s internal issues; however this country also faces problems. Some of the countries attending this meeting are facing drug trafficking, smuggling, paramilitarism and endless wars. We want peace for them. In the case of Costa Rica, President Alvarado, our workerist government and President, who was a recognized labor unionist, are willing to help the government of Costa Rica so you can engage in a social and respectful dialogue with the Costa Rican working class who have been on strike for more than 68 days against the tax reforms. We offer our total support in this respect. For Europe, Latin America is fundamental, but above all, for the Mediterranean countries and especially for the Iberian Peninsula. In this light, this Summit has to be a bridge from Europe to Latin America and from Latin America to Europe, and I believe we have to permanently protect, enrich and strengthen it. We consider that the 2030 agenda and its sustainable development objectives should be adopted first at a national level, by the Presidents, Head of delegations – who have already talked about how they are adopting the agenda -, then, at regional and finally at global level. We think this is the right strategy and that the Principality of Andorra and the Ibero-American Secretariat will keep strengthening the agenda. In the Venezuelan case, our Homeland Plan is not only in coordination and in tune with the Sustainable Development Objectives. Also, the 2019-2025 Plan has been designed in conformity with the United Nations agencies in order to fully meet the Sustainable Development Objectives, their indicators and monitoring processes. From our point of view, the fulfillment of the Sustainable Development Objectives and the 2030 Agenda should be a global social Revolution. It is the time of the defense of multilateralism. It is the time to put differences aside to defend the multilateral bodies. There is an outpost of unilateralism, hegemonism. In this context, our continent has always been characterized for defending the collective decision-making and construction of a better world. We are in solidarity with Cuba that has been blockaded for more than five decades, despite such blockade was overthrown ten times in one hour, in the United Nations last November 1st. For the first time in the history of the United Nations, the United States of America loses 10 votes in one hour, precisely in rejection of that infamous blockade against the Cuban people. Likewise, we are in solidarity with Nicaragua, a country that, as Venezuela, is being besieged in the international arena. After peace and political stability are achieved, the international siege and threats rage against us. An example of it is the unilateral coercive measures and the purported sanctions that must be rejected by all of us. Let me finish reading the last paragraph of Liberator Simon Bolivar’s Angostura Speech. As stated by the Vice President of Uruguay, the Ibero-American Summit shall serve, precisely – by virtue of the majesty of the modern world and the Iberian Peninsula jointly with that new world – to highlight our heterogeneity and diversity and, over it, our equality and finally our unity.